The Armstrong Whitworth Atlas was designed to replace the de Havilland DH.9A biplane of 1918 as well as the Bristol Fighter of 1916 against the RAF requirements of Specification 20/25. The Atlas design was intended to replace both airframes as the primary RAF "army co-operation" (mission liaison) mount. The Atlas was attributed to an engineering team led by John Lloyd who headed up design at the Armstrong Whitworth Aircraft firm as its Chief Designer. Armstrong Whitworth and Lloyd's design team initially undertook the Atlas project as a private venture, the prototype first flying on May 10th, 1925. 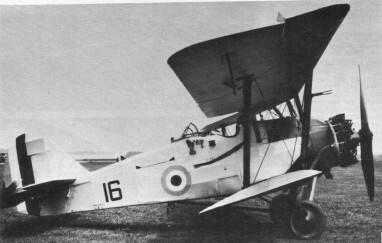 The RAF then accepted the prototype for evaluation against other aircraft and the two-seat Atlas biplane proved a sound design save for some noticeable "sideslipping". The issue was resolved with the fitting of new metal wings that featured sweepback. However, the new wings degraded the quality of the aircraft's in-flight handling - then deemed excellent - and now showcased poor stall characteristics as well. As such, automatic slats were added to the wings and sweep was increased to an extent and, in the case of aircraft for the RCAF, the addition of ailerons on the lower wings. This rectified the less-than-stellar handling characteristics caused by the wing change. Production of the Atlas began soon after with the aircraft formally introduced for service with the British Royal Air Force in 1927, an initial production batch numbering 37 aircraft. The Atlas entered service with 13 Squadron and 26 Squadron immediately and was eventually fielded with the overseas 208 Squadron out of Heliopolis, Egypt in 1930. It served in the mission liaison role - as well as trainer and communications - up until she was retired in 1935. The initial production model became the Atlas I and some 271 examples were delivered to the RAF. Production lasted from 1927 to 1933 to which 478 were ultimately produced. 175 were dual-control advanced trainers. The Atlas Trainer served as a dual-control mount in the training of future Atlas pilots. These aircraft were to remain in service until 1934 in the army cooperation role, and as advanced trainers and communications aircraft into 1935. Beyond British use, the Atlas was in the inventories of Canada, Egypt and Japan. The Atlas was eventually superseded by the Hawker Audax, based on the Hawker Hart biplane, and its trainer derivatives were themselves replaced by the Hawker Hart Trainer. The Atlas II soon appeared as an improved Atlas model with more output from its Armstrong Siddeley Panther IIA engine of 525 horsepower/399kW, radio, message pick-up hook and cameras. However, the RAF elected to go with the competing Audax design and 15 of this model were delivered to the Chinese Air Force. Ajax represented Atlas I models with slight variations and only 4 were ever built for the RAF. Aries was a proposed and improved Atlas I model with slightly larger surfaces and overall dimensions while also being made easier to maintain in the field. However, only one was ever completed. The EAF Atlas was an export product for the Greek Air Force (Hellenic Air Force) that primarily differed in its selected engine, propeller and wing assemblies. At least 10 of this model were locally built by EAF (State Aircraft Factory) in Greece after 1931. The last Armstrong Siddeley Atlas in RAF service was fielded by 208 Squadron, which replaced their aircraft with the newer Hawker Audax in 1935. Privately-held Atlas aircraft operated until 1938. Engine: 1 x Armstrong Siddeley Jaguar IVC, 450hp / 298kW.